The Force Awakens: HERE THERE BE SPOILERS!!! Re: The Force Awakens: HERE THERE BE SPOILERS!!! Just brought the Art of. No wonder if looked like that made up the last half as they went along. Ford spent most of empire harrasing Lucas to kill of Han Solo as (and I quote) "he's the only caractor, without purpose. So should sacrifice himself to save his friends". Apparently Ford got such a monk on he sulked for most of ROTJ. And it shows in his performance. 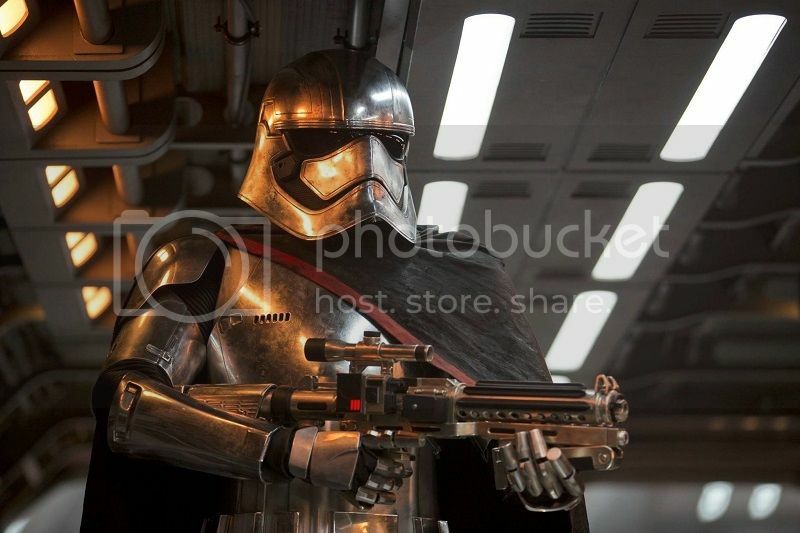 I want more of Captain Phasma. Look at those big dark eyes, that sexxy cape, and that sultry, oily sheen on her armor. Late to the party here, but I loved it. Saw it four times. Yes, it has it's flaws, most notably being the plot draws from ANH and the whole other Death Star thing. (May this will be the last time it is ever used again!) If they were going to use yet another Death Star super weapon, then it should have been something akin to the Darksaber from the novels. Basically the prototype of the superlaser made mobile by the Hutt's. But that in itself wasn't bad. It is basically a reboot/sequel, and if they feel they had to take from another story in order to re-familiarize the audience with the story, then ANH was not a bad bet. Taking from ANH can never be a bad thing in my opinion! As for Han's death, Ford has wanted that for a long time, and I think it was the main stipulation for his returning. I will however take issue with the belief that his death was not heroic. C'mon, a father stepping above a chasm, literally and figuratively, as Kylo could have gone either way in that moment, was heroic! What was sad was that he was hearing one thing from Kylo, while his son was saying the exact opposite. He wanted to believe that his son still had light in him, and he was correct. But even if he had known Kylo would choose the Dark Side, I think Han still would have gone across that bridge. Ben was his son. If you love your children, you do anything for them. Even give your life. Back to Starkiller base, that wasn't the climax of the story for me. It was fun to watch, despite the deja'vu, but for me, the real main event was the lightsaber duels. You just know that Kylo was toying with Finn, as he had Finn on the defensive from the first charge. It wasn't until Finn caught a lucky hit on Kylo's arm that Kylo took it seriously. Consider, that after that hit from Finn, Kylo had him disarmed and on the ground in two moves. Then there was Rey... Ahh, Rey. What a hottie! The moment her force pull overcomes Kylo's and that saber flies into her hand was epic! Although I have to wonder of we'll see her wielding a saberstaff in the next movies as Maul did? She seems to prefer the staff after all. As to her parentage, I'm of course hoping that Luke is her father. I think her mother was 'Mara Jade,' and Kylo killed her just as Jacen Solo did in the books. But not until after she had left young Rey on Jakku for her own safety. With her murdered and Rey missing, Luke may think that both his wife and daughter were dead. Last edited by Tiberious; 01-19-2016 at 04:13 PM. No arguments here, Apophis. The easiest thing that could be done would be for Revell to partner up with Bandai and release the Bandai kits under a Revell/Bandai nameplate.